For years, my wife had been wanting us to get a dog. I have always been a dog lover, but in my 20’s had become quite allergic to some breeds. I was scared that we would get one, and have to give him up because of my allergies. 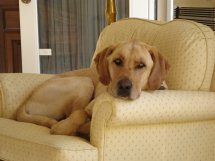 One day, my wife emailed me a couple of pictures of a beautiful labrador retriever named Bentley. His owner was moving and couldn’t bring him, and wanted to place him in a good home. We met Bentley in January of ’08, and within a couple of weeks he became ours. My allergies didn’t flare up too badly around him, and now don’t bother me at all. He is truly our best friend, and couldn’t imagine life without him. We just celebrated 2 years with him, and are already planning his 5th birthday party in April, just kidding… sort of. As far as his name, I’m not exactly sure how he got the name Bentley. My guess is it came from the fact that his tail has a little bend in it. Bent = Bentley…?? It works for me, and would have never dreamed of changing it. He is Bentley, and always will be.